Still need more? We have 3 phase power, event lighting, microphones, recording and much more all in house. Should you need anything extra we have fantastic links with AV hire companies that can cater for your every need. 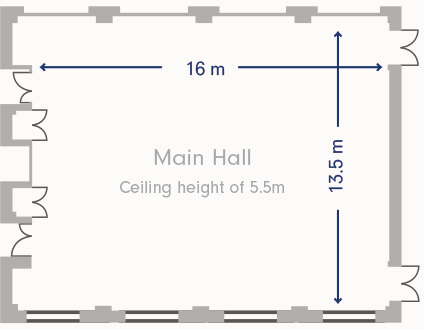 The hall is 16 x 13.5 metres (LxW) with a ceiling height of 5.5 metres. The capacity for each layout is shown below.